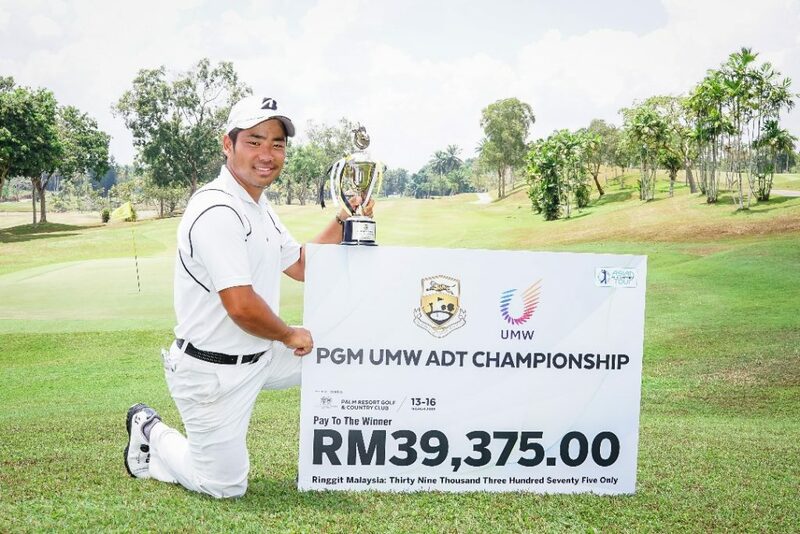 Johor, Malaysia, March 16: Japan’s Kazuki Higa secured his second Asian Development Tour (ADT) title with a superb seven-under-par 65 in the final round of the PGM UMW ADT Championship on Saturday. The 23-year-old Higa finished tied-second at the Palm Resort Golf and Country Club last week but made sure he would not take another runner-up finish when he cruised to a six-shot victory at the same venue with his four-day winning total of 22-under-par 266. Compatriot Naoki Sekito signed for a 67 to share second place with overnight leader Shintaro Kobayashi who closed with a disappointing 72 at the RM225,000 (approximately US$54,000) event. 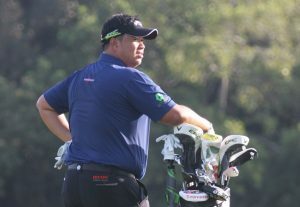 Malaysian’s Ben Leong was the highest-placed local when he ended his campaign with a 72 to finish in tied-fourth with four other players. Starting the day one shot off the pace, Higa dropped a shot on his second hole but recovered quickly with a birdie on hole three. He went on to nail birdies on holes six, eight and nine to make the turn in 33. “I wasn’t happy with how I was hitting it yesterday so I did some work at the range after my game and it really helped my round today. I stayed consistent and was hitting shots exactly how I wanted to,” said Higa, who claimed his maiden ADT victory last April in Bangladesh. The Japanese trusted his abilities and extended his advantage with further birdies on holes 11, 12, 16 and 18 for a 32 in his homeward nine. “I knew I was so close to getting a win last week and that really gave me the motivation I needed to get the job done today. I just told myself to trust myself and not think about how other people were playing,” added Higa, who moved up to third place on the Merit rankings. He took home the winner’s prize purse of US$9,627.23 and received six Official World Golf Ranking (OWGR) points while the other top six players and ties earned points based on a sliding scale. 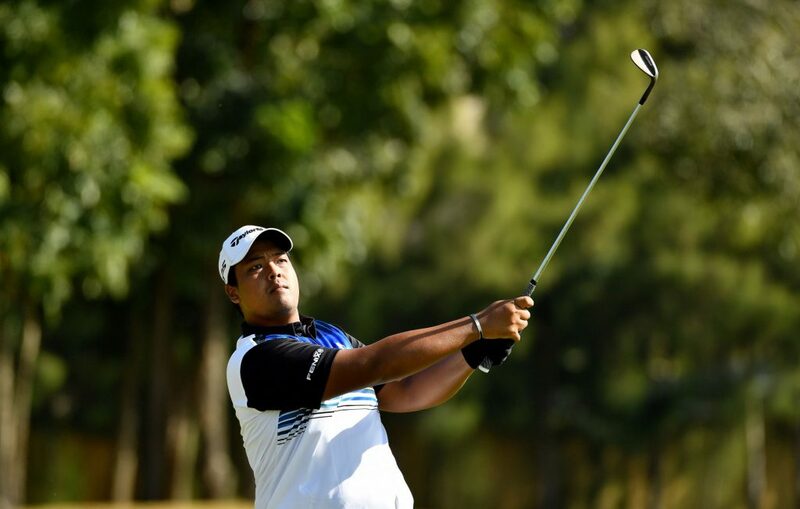 The 21-year-old Sekito took pride in his joint runner-up finish which was also his personal-best finish on the ADT since his tied-fourth result in October last year. “I was hitting my driver and long irons really well and was pretty consistent all week. I only missed three greens today and my only two mistakes were on holes five and 15 when I three-putted for bogey,” said the Japanese, who resides in Hiroshima. Focusing on the ADT this year, Sekito aims to finish inside the top-seven on the final ADT Order of Merit to earn playing rights on the Asian Tour for the 2020 season. “This week really boosted my confidence. I am glad that all my hard work that I did back home is paying off and now my goal is to finish inside the top-seven on the ADT,” added the Japanese, who traded eight birdies against three bogeys. 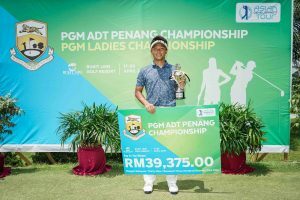 Johor, Malaysia, March 13: Malaysia’s Ben Leong set the pace with an impressive seven-under-par 65 in the opening round of the PGM UMW ADT Championship on Wednesday. 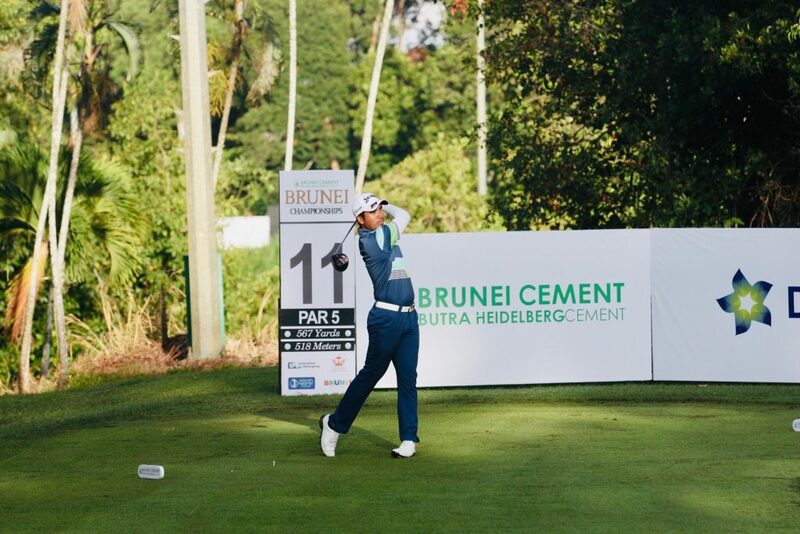 The 33-year-old Sabahan, a one-time Asian Tour winner, carded a bogey-free round highlighted by five birdies and an eagle to lead by one shot at the RM225,000 (approximately US$54,000) Asian Development Tour (ADT) event. Countryman Leunkwang Kim and Wang Wei-lun of Chinese Taipei share second place following matching 66s while four players trail a shot behind in fourth place including Gregory Foo of Singapore, Japan’s Hayato Yoshida, Erwan Vieilledent of France and American Kerry Sweeney at the Palm Resort Golf and Country Club. 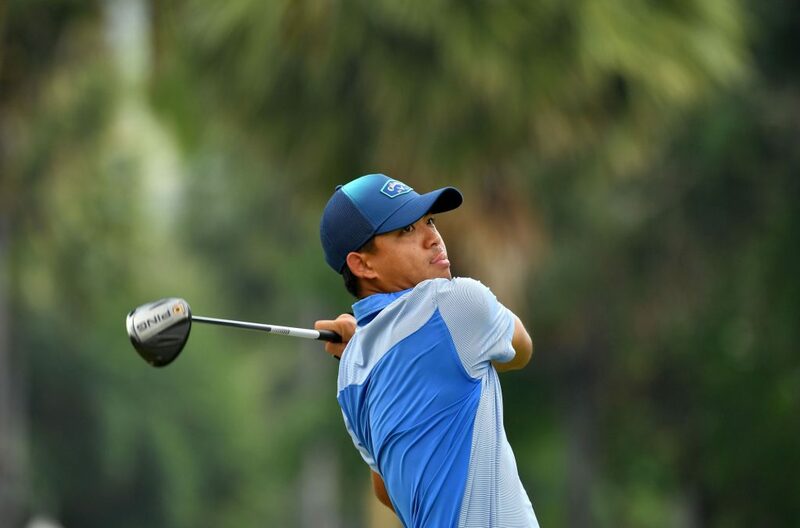 Leong, who completed a wire-to-wire victory on home soil for his second ADT title last August, was pleased to capitalize on the reachable par-five holes, thanks to his solid iron-play coupled with a hot putter. “I did well on all the par-five holes today. They are all pretty reachable holes so I took advantage of those holes to go low today,” said Leong, who navigated around the greens in 25 putts. Starting from the back-nine 10, Leong nailed three birdies in his opening 11 holes before igniting his flawless round with an eagle on hole three. “I did better on my back-nine and made an eagle on the par five-third hole after hitting the green in two shots with my six iron and then making a 20-foot putt. The greens here are pretty unpredictable so I was just happy to make the putt to give me an added boost,” added Leong, who fired two more birdies on his way home. Despite struggling with his swing towards the middle of the round, the 24-year-old Kim took pride in his strong finish where he made consecutive birdies in his closing three holes for a bogey-free opening round. “I started out good and was three-under-par after six holes. Then I struggled a little with my irons in the middle of the round but I managed to pull it together towards the end,” said Kim. “I hit a nice pitch shot from 50 metres on the last hole to a foot from the flag which was a great way to end. I putted a lot better today compared to last week because I am getting a lot more comfortable with the speed of the greens,” added the Malaysian, who took a tied-32nd result at the ADT event staged at the same venue last week. All ADT events offer Official World Golf Ranking (OWGR) points. The winner will receive a minimum of six OWGR points while the top six players and ties will also earn points based on a sliding scale. Johor, Malaysia, March 12: In-form Poom Pattaropong of Thailand hopes to put up another title run for his maiden Asian Development Tour (ADT) victory when he tees off for the PGM UMW ADT Championship starting Wednesday. 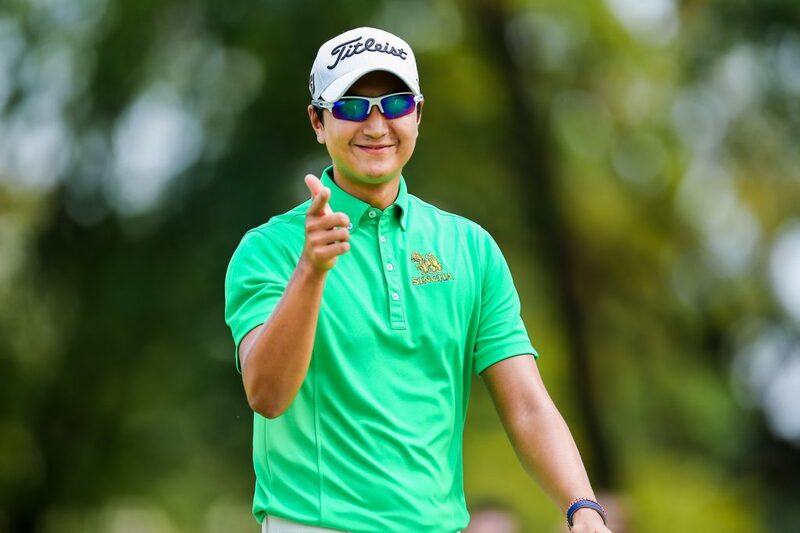 The 23-year-old Poom, who enjoyed a joint runner-up finish at the Palm Resort Golf and Country Club last week, is looking to ride on his fine form as he continues to chase for a breakthrough at the RM225,000 (approximately US$54,000) event, which will be held on the same venue this week. Since joining the play-for-pay ranks in January 2018, Poom has endured several near-misses for his maiden title on the region’s secondary circuit. He came agonisingly close to winning in Indonesia last August where he was locked in an epic play-off duel against reigning ADT Order of Merit champion Miguel Carballo of Argentina. He went the distance with Carballo and was eventually defeated on the seventh play-off hole in the event, which would go down the record books as the longest play-off on the ADT since the circuit was inaugurated in 2010. 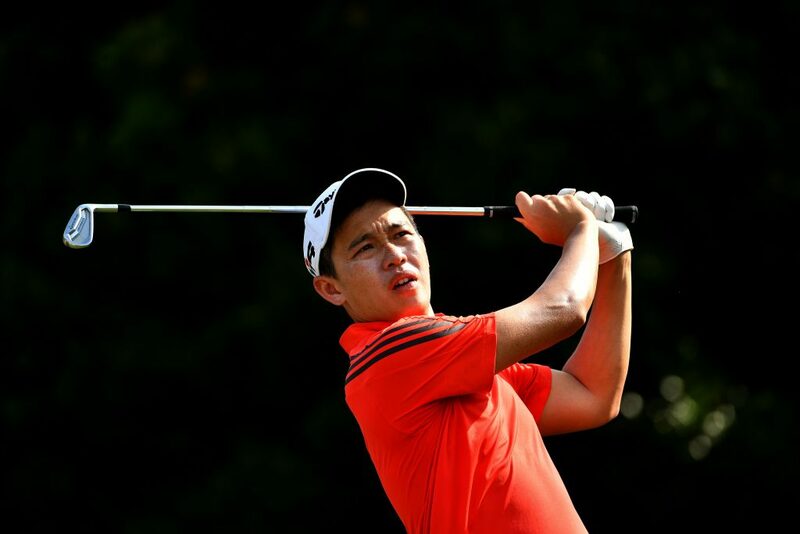 Poom, however, went on to notch three other top-10s to finish in 15th place on the 2018 ADT Order of Merit and secure his 2019 Asian Tour card in his second attempt at the Qualifying School, where he came in fifth following a gruelling 90-hole battle. Despite failing to capitalise on his overnight four-shot lead heading into the final round last week, Poom was quick to take the positives and is confident that the experience will help him rise to the occasion in time to come. “I played well all of last week but just didn’t get the putter going on the final day. I have learned a lot from those near-misses. I just need to focus on my own game now instead of what others are doing,” said Poom. “I started working with my coach Annop Tangkamolprasert last August and we have seen significant improvements in my game right after fixing my swing. Annop used to play regularly on the ADT and I see him as often as I can when he is in Thailand, since he is currently based in Vietnam,” Poom added. Poom will feature in the 144-men field alongside compatriot Itthipat Buranatanyarat, the highest-ranked player in second place on the current money list, as well as Merit champions Carballo and Pannakorn Uthaipas, who is chasing for back-to-back victories after lifting his second ADT victory last week. Asian Tour winners Ben Leong, Nicholas Fung and Danny Chia will spearhead the local charge in the event, which will mark the fourth leg of the ADT schedule this season. 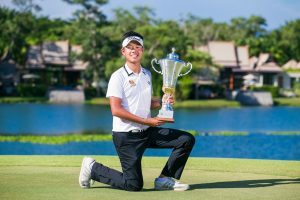 Johor, Malaysia, March 9: Pannakorn Uthaipas of Thailand overcame a four-shot deficit to win his second Asian Development Tour (ADT) title at the PGM ADT Johor Championship on Saturday. The 28-year-old Pannakorn had a terrible start as he dropped a shot on the second hole, which distanced him and the overnight leader, Poom Pattaropong of Thailand, to six shots. However, the bogey sharpened Pannakorn’s resolve and he began to attack the pin at the Palm Resort Golf and Country Club. The strategy worked, as he shot an eagle and five birdies before signing for a 20-under-par 268 total to win the tournament by two shots. Poom was not able to get his final round going. The three birdies he made were negated by the equal number of bogeys. He had to contend with a tied-second finish along with Japan’s Kazuki Higa. Higa, on the other hand, was making a charge at the leaders. The one-time ADT winner shot eight birdies and did not drop a single shot on his first 16 holes. However, his tournament unravelled after making a bogey on the 17th. Malaysia’s Daeng Rahman was also making a sprint to the finish. He traded an eagle and five birdies against a lone bogey to a card six-under-par 30 on his back-nine, which helped him climb from tied-ninth to tied-fourth. “I was only focussing on my game. I played very well in the first two rounds and I know that my game is in a good place,” he said, on playing with his friend Poom, who had a four-shot lead at the start of the day. With this win, Pannakorn is now aiming to win the ADT Order of Merit for the second time. Previously, he won topped the money list in 2017. The merit champion, as well as the leading six players on the final ADT Order of Merit will earn playing rights on the premier Asian Tour for the 2020 season. Johor, Malaysia, March 8: Poom Pattaropong of Thailand moved into the lead after carding a five-under-par 67 in the third round of the PGM ADT Johor Championship on Friday. The 23-year-old Poom had an eventful day, as he shot an eagle, five birdies and two bogeys for an 18-under-par 198 total at the Palm Resort Golf and Country Club. He has a four-shot lead going into the final round of the tournament, co-sanctioned by the Asian Development Tour (ADT) and the Professional Golf of Malaysia (PGM). In second place is compatriot Pannakorn Uthaipas, who went slightly off the boil as he carded a 72. Lloyd Jefferson Go of the Philippines (71), and Japan’s Genki Okada (68) as well as Kazuki Higa (68) are in third, fourth and fifth place respectively. Poom’s eagle on the 16th gave him a mental boost for the final round. “I hit a pretty good drive and used a nine-iron to get it onto the fringe, 10-feet from the hole. I managed to make an eagle from there. It was a huge confidence booster and it has set me up very nicely for tomorrow,” said Poom, who earned an Asian Tour card via Qualifying School earlier this year. 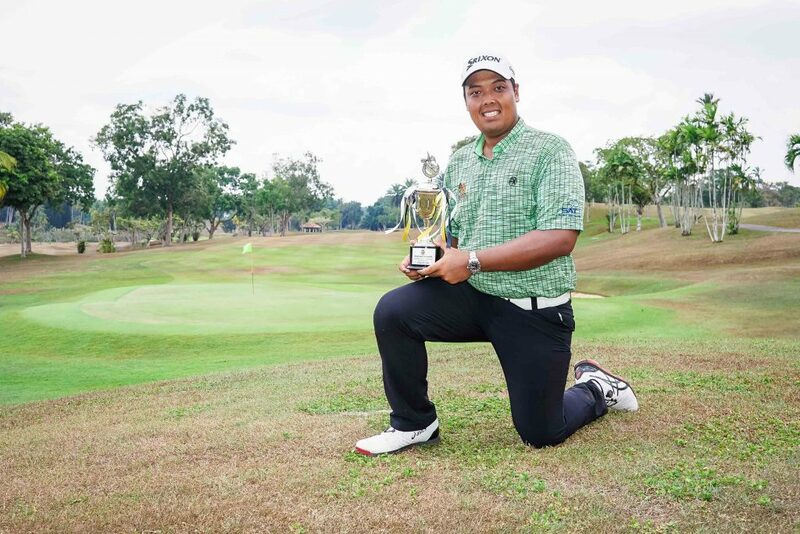 Johor, Malaysia, March 7: Amir Nazrin of Malaysia kept the local hope alive as he shot a five-under-par 67 to finish the second round in tied-second at the weather-disrupted PGM ADT Johor Championship. The 21-year-old Amir got himself into contention after carding a near-flawless round that is highlighted by six birdies. He dropped only one shot on the par-four 10th before signing for a nine-under-par 135 total at the Palm Resort Golf and Country Club. 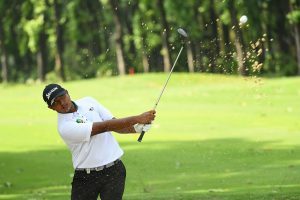 Amir is three shots behind the clubhouse leader, Lloyd Jefferson Go of the Philippines, at the RM 225,000 (approximately US$54,000) tournament, co-sanctioned by the Asian Development Tour (ADT) and the Professional Golf of Malaysia (PGM). Go, in line for a breakthrough win on the ADT, carded his second consecutive 66. The 24-year-old traded an eagle and five birdies against a lone bogey to end his Thursday on 132. “I was playing and hitting the ball well going into the tournament. In particular, I’ve been hitting my iron shots very well, so even if the ball is on the rough, I can hit it close to the hole,” he explained. Ryan Troyer of the United States scored an ace. He achieved the feat on hole two from a distance of 176 yards using his eight iron. Round two will restart at 7.40am on Friday, with the third round commencing not before 9.50am. Johor, Malaysia, March 6: Pannakorn Uthaipas of Thailand set the early pace with a resplendent nine-under-par 63 following the first round of the PGM ADT Johor Championship on Wednesday. The 28-year-old Pannakorn hit the ground running, shooting four birdies in his opening five holes. He carried the momentum after making the turn at 18, carding five more birdies before signing for a 63 at the Palm Resort Golf and Country Club. Compatriot Poom Pattaropong is just a shot behind in tied-second. Like Pannakorn, he enjoyed a bogey-free round at the RM 225,000 (approximately US$54,000) tournament, co-sanctioned by the Asian Development Tour (ADT) and the Professional Golf of Malaysia (PGM). Joining Poom on 64 is Korea’s Joohyung Kim and Malaysia’s Kenneth Tobuse. Defending champion Johnson Poh of Singapore is four shots off the lead, in tied-eighth. Pannakorn credited his excellent round to his good ball striking and big-game mindset. “I was hitting my driver and irons very well, and I found almost all the fairways today. In fact, I missed about three or four short birdie putts. If I had made those, my good round would have been even better!” he said. Pannakorn won the 2017 ADT Order of Merit and earned an Asian Tour card for the 2018 season. He was not able to retain his card after finishing in 100th place on the Asian Tour Habitat for Humanity Standings, but the experience of playing on Asia’s premier circuit has put him in good stead. Johor, Malaysia, March 5: Singapore’s Johnson Poh is banking on his good early season form and positive vibes from last year’s tournament as he tees up for the PGM ADT Johor Championship which tees off tomorrow. The 27-year-old Poh shot his lowest four-round score ever at the 2018 edition of the tournament to win his first Asian Development Tour (ADT) title. The Singaporean carded a 21-under-par 267 total for a two-shot victory at the Palm Resort Golf and Country Club, which will also be the host venue for this year’s PGM ADT Johor Championship. Poh went on to finish the season in 13th place on the 2018 ADT Order of Merit, coming agonisingly close to snatching on one of the seven Asian Tour cards on offer. The Singaporean hopes to do better this season. Poh’s title ambitions will be put to test by the likes of ADT Order of Merit champions Miguel Carballo of Argentina (2018) and Pannakorn Uthaipas of Thailand (2017), as well as ADT winners Shinichi Mizuno of Japan and Sam Gillis of the United States. 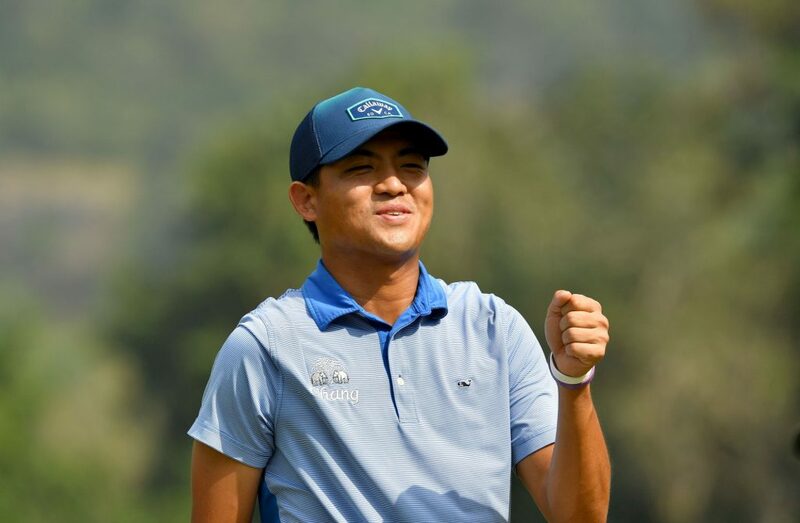 Lopburi, Thailand, February 17: Thailand’s Sadom Kaewkanjana had a magical ace to thank for helping him win his maiden victory by five shots following a two-under-par 68 in the final round of the Thongchai Jaidee Foundation 2019 on Sunday. The 20-year-old Thai holed out from 175 yards on hole two after sweetly striking his seven-iron for his first hole-in-one of his professional career at the 13th Military Circle Golf Course, the venue where tournament host Thongchai Jaidee grew up playing on. 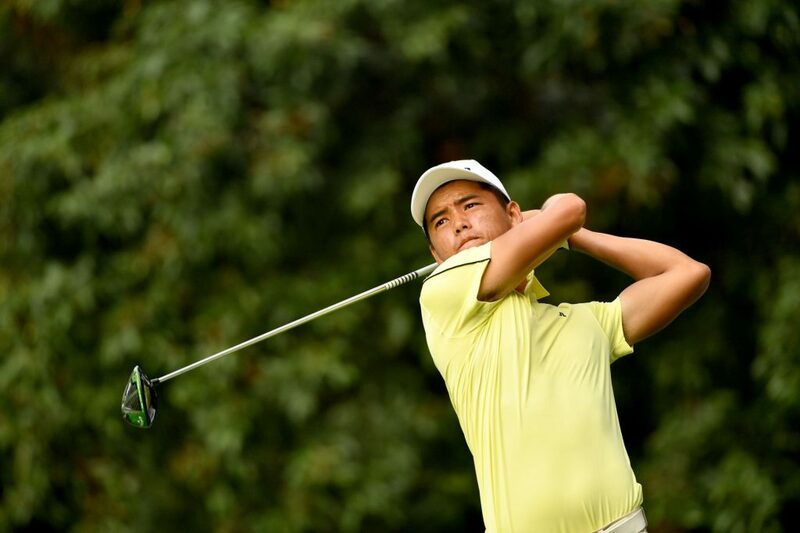 Thai-Japanese Kosuke Hamamoto signed for a 65 to take second place while Korea’s Soomin Lee posted a 69 to sit in third place at the ฿4million (approximately US$123,000) Asian Development Tour (ADT) event jointly sanctioned by the All Thailand Golf Tour. With his four-day total of 14-under-par 266, Sadom took home a winner’s prize purse of US$22,372 and earned six Official World Golf Ranking (OWGR) points, in only his third event since joining the play-for-pay ranks in December last year. Sadom, who came through Asian Tour Qualifying School in January after finishing in tied-13th, was delighted to find success so early on in his career. “I am very happy to win on the ADT. I was very excited to start the round today and then the hole-in-one came out of nowhere. I just wanted to hit the green and make par but that was a nice surprise and I got really lucky,” said Sadom. The young Thai, who marked his card with one double-bogey, one bogey, three birdies and an ace, credited his ability to stay composed despite almost losing the lead towards the middle of the round. “I was looking at the scores and Soomin (Lee) was only one shot behind after hole 12 when I dropped a shot and he made birdie. I told myself I needed to make more birdies and I did. After hole 13 and 14 I was more confident,” added Sadom, who propelled to the top of the ADT Order of Merit courtesy of his victory. Lee, a one-time European Tour winner, took pride in his performance this week despite struggling towards the end of his final round. “I played well all week and was playing well until hole 17 when I three-putted for double-bogey and hole 18 where I hit my tee shot into the hazard. But I am excited with the progress I have made in my game this week,” said the 25-year-old. Playing in his first ADT event on an invitation spot, Lee was impressed with the talent on the region’s secondary circuit and tipped his hat off to his playing partner Sadom. “I gave it my best today but Sadom was just too good of a player. I am happy that he won because he did play really well,” added the Korean. The Thongchai Jaidee Foundation 2019 was inaugurated in 2015 with the intention of providing more playing opportunities for the region’s rising stars as well as to draw attention to Thongchai’s charitable foundation. Full results and OOM click here. 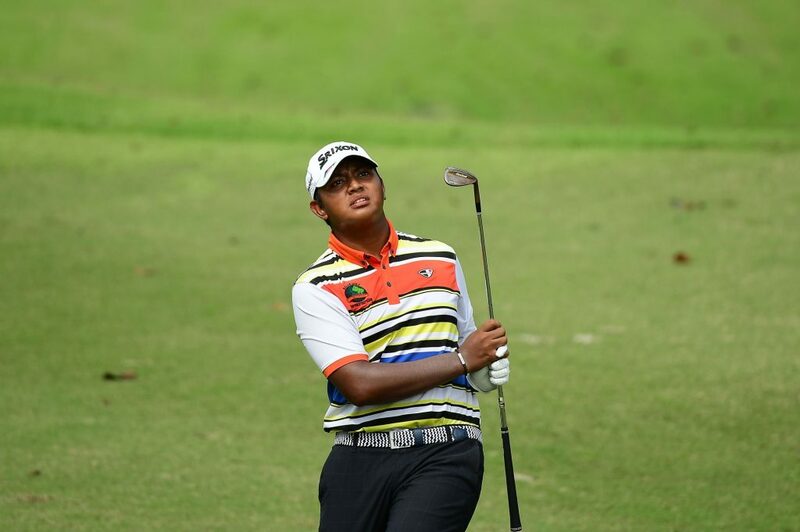 Lopburi, Thailand, February 16: Young Thai Sadom Kaewkanjana fired a commendable six-under-par 64 to grab the lead in the third round of the Thongchai Jaidee Foundation 2019 on Saturday. Chasing for his maiden victory this week, the 20-year-old Thai traded seven birdies against one bogey to lead by five shots on a 12-under-par 198 total at the 13th Military Circle Golf Course, the venue where tournament host Thongchai Jaidee grew up playing on. Korea’s Soomin Lee struggled to a 71 to share second place with Thailand’s Chinnarat Phadungsil and American Seungjae Maeng who signed for matching 66s at the ฿4million (approximately US$123,000) event. The in-form Sadom made a fast charge with four birdies in his opening five holes before making the turn in 31. He grabbed birdies on holes 10, 12 and 16 before dropping his first shot of the day on hole 17 for an inward 33. “My putting helped me a lot today. I made three birdies in a row on holes from hole three because I was rolling in 15-footers,” said Sadom, who only needed 25 putts. Coming off a tied-fourth finish on his local circuit last week, Sadom was pleased to carry over the momentum to shoot his personal-best round in only his second ADT tournament since turning professional at the end of last year. “This will be the first time I am playing in the final group on the final day in an ADT event. Honestly, I will just be following the same game plan. My sister and my parents have been coming out to watch me and I want to do them proud tomorrow,” added the Thai. The 24-year-old Maeng, who came through Asian Tour Qualifying School this year after finishing in tied-30th, credited his conservative approach off the tee which led him to only miss five greens and surge into contention. “It was a solid round today where I didn’t make any mistakes. I played really conservative off the tee which worked out well. I was also hitting my irons well especially with my three, four and five-irons so every birdie I had today was inside eight feet,” said the American, who traded five birdies against one bogey. “Towards the end of last year, I made a few swing changes and from there on I stuck to it. This is my second event of the year and I am confident in how my game is looking. 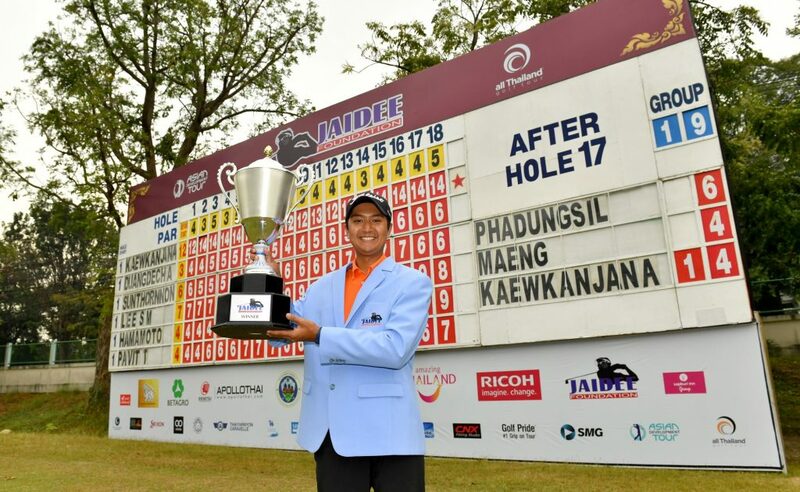 I will just stick to this game plan and see what happens,” said Maeng, who has not had a top-10 finish on the ADT since the Thongchai Jaidee Foundation in 2017 where he finished in tied-sixth. The Thongchai Jaidee Foundation 2019, jointly-sanctioned by the All Thailand Golf Tour and the ADT, was inaugurated in 2015 with the intention of providing more playing opportunities for the region’s rising stars as well as to draw attention to Thongchai’s charitable foundation.